On Wednesday, October 12, visiting artist Meghana Jain Singh was a guest lecturer in Meeta Mastani's course "Tactile Textiles: From 2D to 3D." Meghana Jain Singh is an Associate Professor at the Indian Institute of Crafts & Design, Jaipur. Trained in multiple skills in design and education domains, she has been part of commercial and grassroots design setups, design colleges, schools and special education, including designing contemporary hand prints for the last ten years. 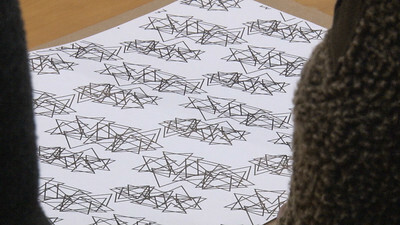 During her visit, she worked with students to facilitate the process of developing a concept into a print. 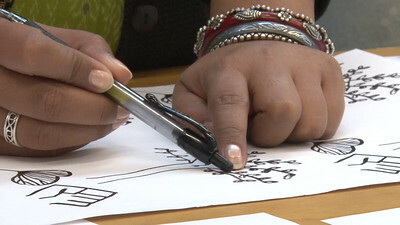 Meghana Jain Singh visited Meeta's class to facilitate the process of developing a concept into a print with students. Students worked with wood-block artist, Meghana Jain Singh, to create designs for their final projects. 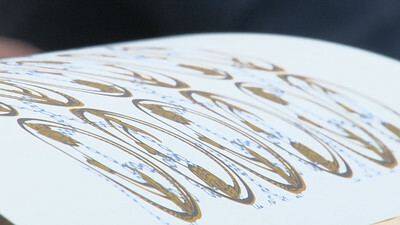 Example of a students print work in progress. Example of a student's print work in progress. 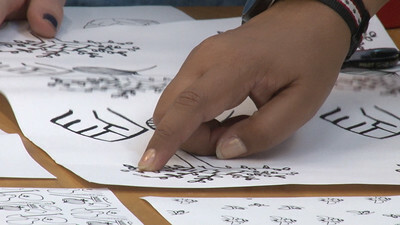 Meghana Jain Singh looking over student’s work in progress, pointing out the details of the piece. Meghana Jain Singh discussing students’ work. Also pictured Meeta Mastani, Catherine Finedore (COE, Biomedical Engineering), and Penny Xiong (Art History). 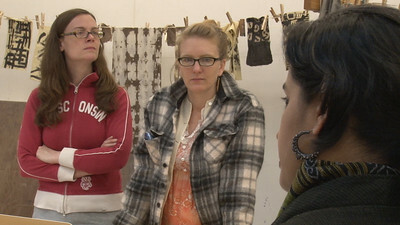 Sarah O'Farrell (MFA, Art), Emily Popp (MFA, Design Studies) and Meghana Jain Singh. Maria Wood (MFA, Design Studies) discussing her work with Meghana Jain Singh and Penny Xiong (Art History). 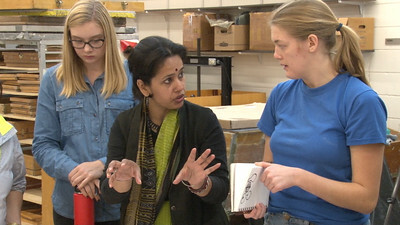 Emily Popp (MFA, Design Studies) discussing her design with Maria Wood (MFA, Design Studies) and Meghana Jain Singh. 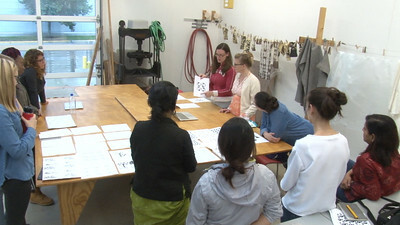 Full view of classroom, as Sarah O'Farrell (MFA, Art) discusses her design. Maria Wood (MFA, Design Studies) discussing her design with the class. Pictured: Meghana Jain Singh, Penny Xiong (Art History, French), Catherine Finedore (COE, Biomedical Engineering), Molly Mapston (Art History), and Lucy Hodkiewicz (Art).